South Asia’s urbanization has been described as “messy, hidden and underleveraged.” A lot has to do with how South Asian countries manage their cities’ spatial development. Between 1999 and 2010, the region’s cities grew about twice as fast in area as they grew in population, which suggests declining average city population densities and increasing sprawl. And when the growth of a city’s footprint exceeds the rate at which it can expand infrastructure and regulate development, spatial planning and services provision typically suffer. The implications are severe, especially when the region’s urban population is estimated to rise by almost 250 million people by 2030. If South Asian cities are to continue harboring the promise of better livelihoods and living conditions for their citizens, then addressing the ability of South Asian countries to manage their cities’ spatial development is critical, in order to alleviate congestion pressures that undermine a city’s livability and hamper agglomeration economies; and to prevent their cities from being further locked in to a pattern of urban sprawl that is prohibitively costly to reverse. • Investing in transport links that improve connectivity between cities to create more efficient systems of cities. It is also critical to invest in improved intracity connectivity and traffic management to enhance mobility within urban areas and ease traffic congestion. • Adopting forward-looking approaches to planning and guiding expansion where it is most rapid—on city peripheries. This approach will reduce the messiness of urbanization, prevent undesirable spatial forms from being locked in, and facilitate future provision of infrastructure and basic urban services. • Unlocking the potential of city cores and carry out rejuvenation where cores have declined by investing in improvements such as better public urban spaces to enhance pedestrian walkability and livability. Promote better management of developable land in city cores through effective land-assembly mechanisms; making better use of publicly owned land; and reusing existing structures in an adaptive, appropriate, and innovative manner. • Most importantly, strengthening institutional capacity to plan, coordinate, implement, and enforce development to deliver integrated, coordinated, and smarter planning policies. By so doing, facilitate the formation of more vibrant neighborhoods and public space through granular and contextual spatial planning approaches. Land use planning must constantly adapt to changes in market demand within a framework that takes a long-term view of a city’s development. There are a handful of successful examples of well-planned cities and initiatives in South Asia but in general, many South Asian cities must face these challenges and decide if they want to continue on the same path or undertake appropriate actions to transform the region’s trajectory of development towards a more prosperous and livable one. Read the full report and its policy recommendations on managing spatial structure and connectivity in chapter 4 of the recently launched publication on “Leveraging Urbanization in South Asia: Managing Spatial Transformation for Prosperity and Livability”. 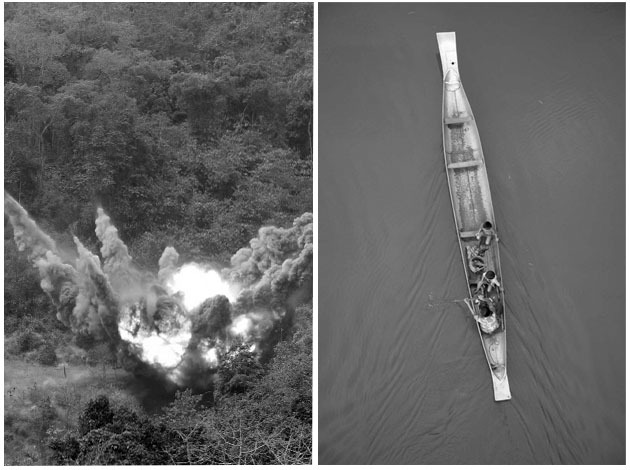 Between 1964 and 1973, the United States dropped around 2.5 million tons of bombs on Laos. While the American public was focused on the war in neighboring Vietnam, the US military was waging a devastating covert campaign to cut off North Vietnamese supply lines through the small Southeast Asian country. The map above, created by photographer Jerry Redfern, provides another view of the massive scale of the bombing. Each point on the map corresponds to one US bombing mission starting in October 1965; multiple planes often flew on missions. 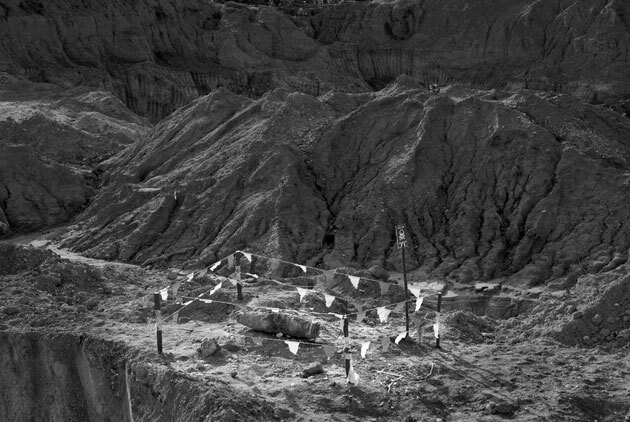 The unfinished aftermath of the air campaign is the subject of Redfern and Karen Coates’ new book, Eternal Harvest: The Legacy of American Bombs in Laos. This stunning book, seven years in the making, documents how the secret air war is still claiming lives more than four decades after it ended. More than 100 Laotians fall victim to unexploded cluster bombs annually, delayed casualties of Operation Barrel Roll and Operation Steel Tiger, which dropped 270 million cluster bomblets. Packed by the dozens or hundreds in canisters, cluster bombs are designed to open in midair, scattering small explosives across a wide radius. Yet not all of them detonated, and today, 80 million live bomblets lurk under Laos’ soil. Cleaning up the unexploded ordnance (UXO) has been agonizingly slow. 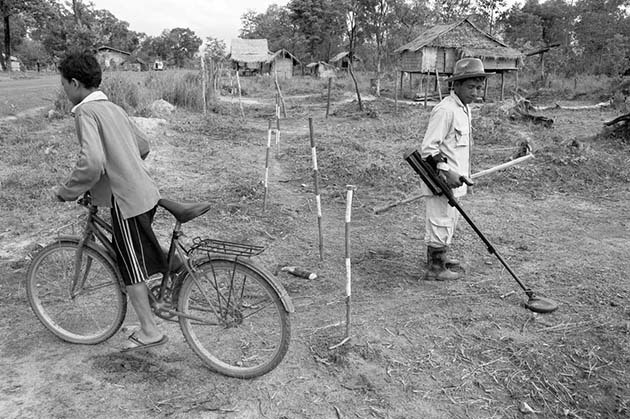 In January, Congress approved $12 million for UXO clearance and related aid in Laos. In comparison, the bombing cost the United States $17 million a day in inflation-adjusted dollars. Below, a selection of Redfern’s photographs from Eternal Harvest. Learn more about his and Coates’ work at their website. 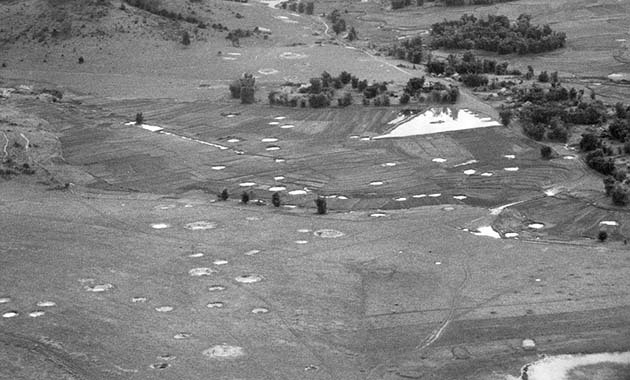 An aerial view of the countryside around Phonsavanh, Laos, shows craters from the US bombing campaign. Workers found this unexploded bomb shell in a quarry. It awaits a clearance team, which will attempt to defuse it safely. 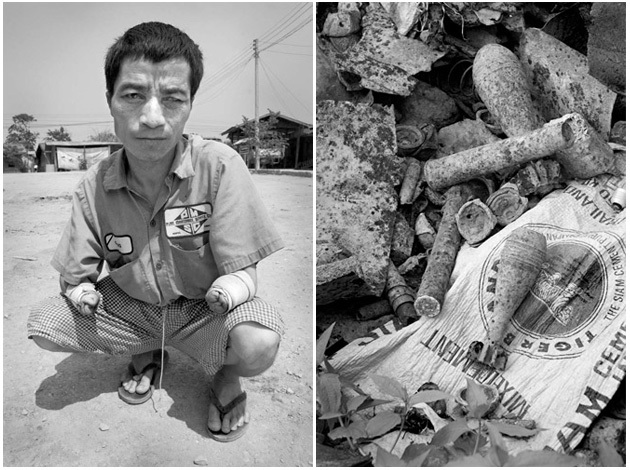 Left: Bo Ya, 35, lost his hands and most of his vision 10 years ago when he picked up some unexploded ordnance (UXO). 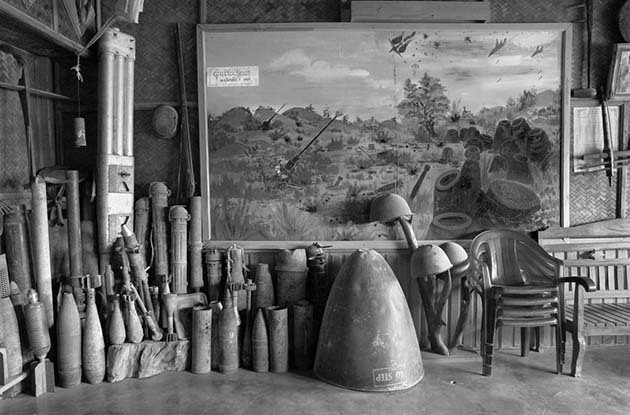 Right: A pile of bomb scrap, shrapnel, and cluster bombs lies next to a new home along the old Ho Chi Minh Trail. A Vietnamese trader and his family eat dinner by a heap of shrapnel and cluster bombs and an artillery shell. Scrap-metal traders buy bomb debris from Laotians who collect it in the fields and forests. A technician with an unexploded ordnance disposal team scans for bombs along the new road built atop the old Ho Chi Minh Trail. People began building new homes in this spot before the area had been cleared. Left: A 750-pound bomb is detonated by a clearance team. Right: A woman and her children paddle down the Banghiang River in a canoe fashioned from fuel tanks dropped by American bombers. 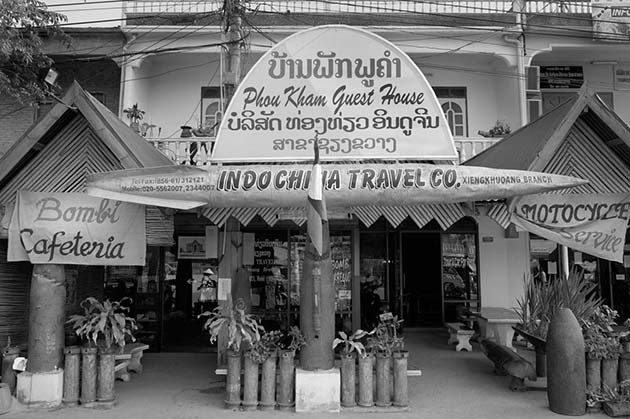 A guesthouse with decorations fashioned from war detritus caters to foreigners in the town of Phonsavanh. 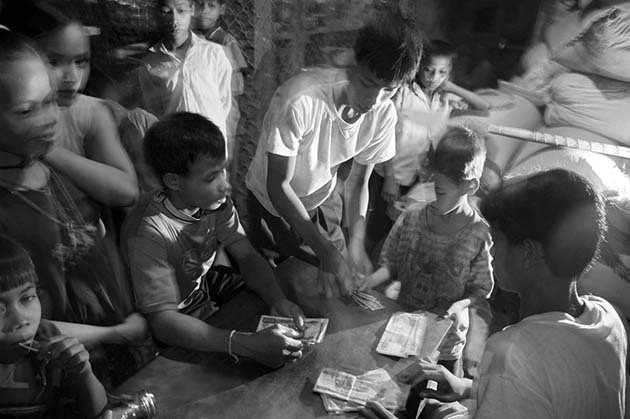 Ethnic Lave kids count the money they earned from selling bomb scrap. The lobby of the Vinh Thong Guesthouse in Phonsavan displays an amazing array of defused UXO as well as a mural depicting the 1968 bombing of the Plain of Jars. 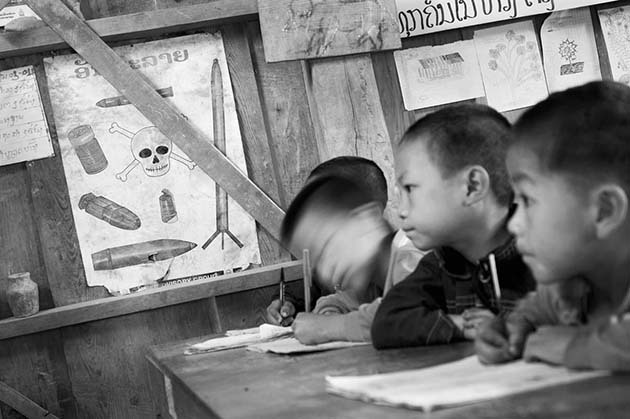 Children study by a UXO warning poster in a one-room schoolhouse in Ban Pakeo. 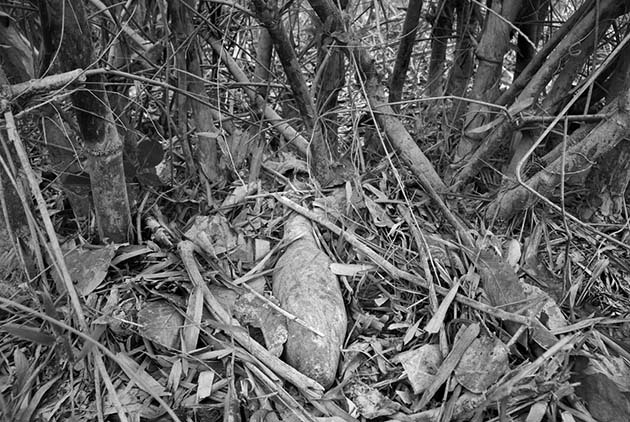 A dud rocket found in a clump of bamboo. It was later detonated by a bomb disposal team. 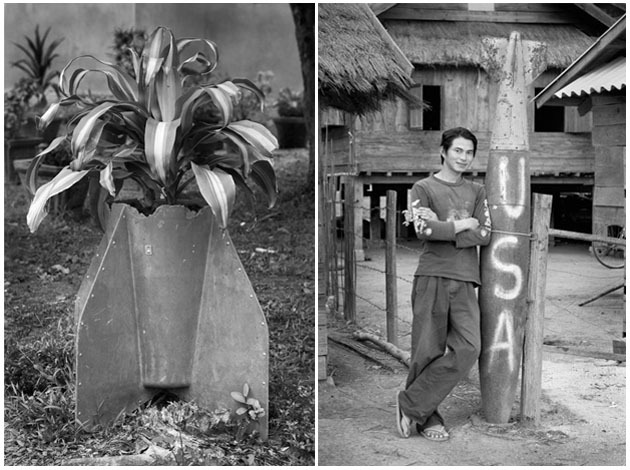 Left: A planter made from the tail fins of an American bomb in Vieng Xay, a former stronghold of the Pathet Lao communist guerillas. Right: Sou Lin Phan poses next to a large dud bomb in the middle of his village in Xieng Khouang Province. Preliminary findings from a soon-to-be released comprehensive report have reinforced dismal projections for the future of Cambodia’s fisheries if 11 planned mainstream hydropower dams are built on the Mekong River. Presented yesterday on the first day of the Greater Mekong Forum on Water, Food and Energy in Phnom Penh, the impact assessment projected more than half of fish catches in regions connected to the Mekong could be lost if the dams – nine in Laos and two in Cambodia – are established in the coming decades. The blocking of fish migratory pathways and a 50 per cent drop in water nutrient levels caused by the trapping of sediment were noted among the major threats to fish and aquatic life posed by the proposed plants. Researcher Ian Cowx, director of the International Fisheries Institute at Britain’s Hull University, said the dam could wipe out 100 per cent of fish that migrate long distances. 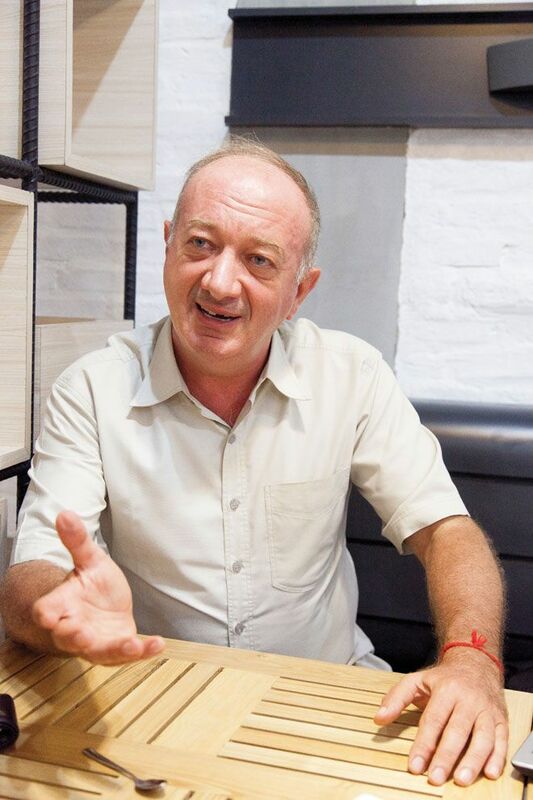 He said there was no such thing as “fish friendly turbines”, and that reservoirs would stop larvae from drifting downstream, which there is “no technological method to overcome”. “When you have 11 dams there ain’t a lot left when you get to the bottom” of the stream, Cowx said. 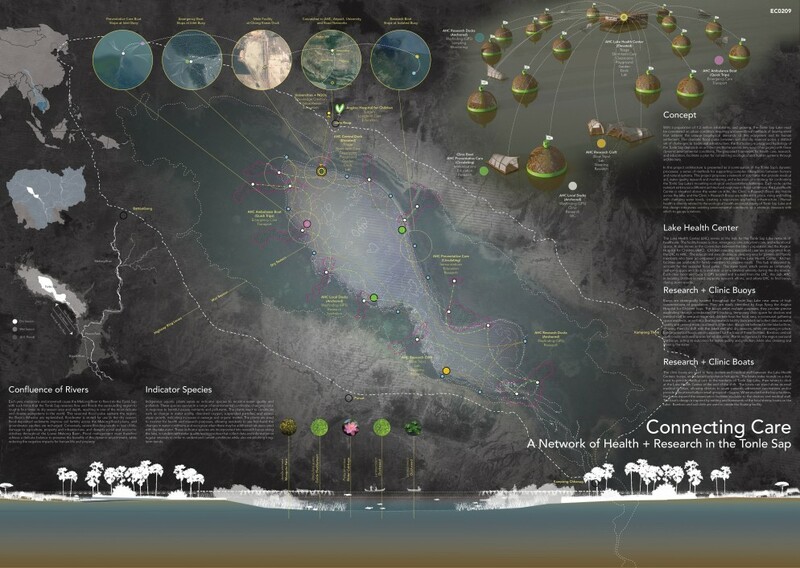 Commissioned by the Vietnam National Mekong River Committee and undertaken by water environment consultancy DHI, the two-and-a-half-year study – set for release in December – focused on the environmental, social and economic impact on the Kingdom’s floodplains, the Mekong Delta in Vietnam and the Tonle Sap lake. Baseline data calculated that fish production in those regions was about 500,000 tonnes for Cambodia and 700,000 tonnes for Vietnam. Citing its need for cheap electricity to develop its economy, Laos has pushed ahead with its hydro plans. The Xayaburi dam in the north of the country is under construction while work on the planned Don Sahong hydropower plant 2 kilometres north of Cambodia’s border is slated to begin soon. A previous study by the Mekong River Commission, which used data from 2000, found the Lower Mekong Basin would lose between 550,000 to 800,000 tonnes, or 26 per cent to 42 per cent, of fish resources, because of planned hydropower development on the Mekong. Floating houses will be built and docked in Gulf Harbour development as a novel way of beating rising land prices. Owners of the Boat Sheds will have a long-term licence agreement for use of the berth where their “house” is moored. 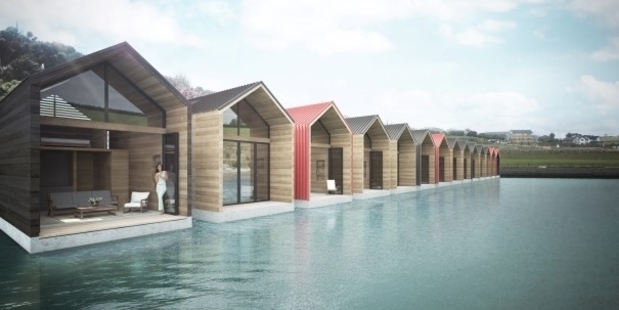 Floating houses are planned for Gulf Harbour, north of Auckland. In what appears to be a novel solution to the city’s tightly constrained land supply and sky-rocketing prices, construction of The Boat Sheds project will begin in the New Year, answering the desire for waterfront location living. Michael Webb-Speight, a development consultant to the Fairway Bay project, said Auckland’s population was increasing fast and houses on the water were an obvious solution. “With land and property becoming scarcer, we need to find ways to better use the water that surrounds the city and we believe this is part of the solution. Many Kiwis dream of living near the water but this takes that to the extreme – living on top of the water in a floating home,” he said, citing a BBC report quoting development experts saying on-the-water communities could be a more sustainable, affordable and safer option than building on land. But deputy mayor Penny Hulse expressed reservations. “The idea of floating houses could have a negative impact on our coastal areas and will have to be carefully considered,” she said. 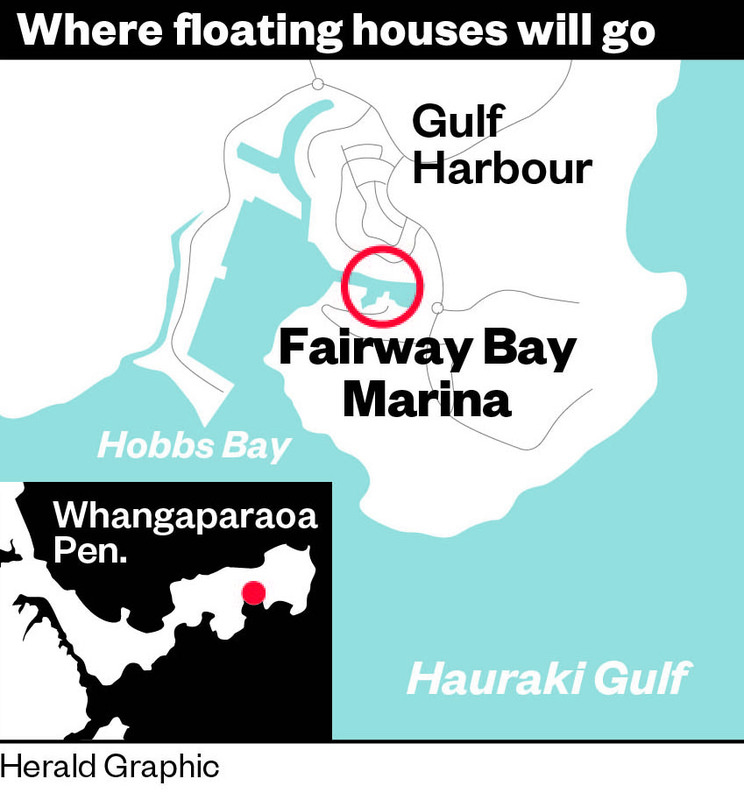 Twenty houses will be docked at the Fairway Bay marina but buyers will not get titles registered in the usual way with Land Information New Zealand. Instead, they will have a long-term licence agreement for use of the berth where their house is moored. Mr Webb-Speight thinks many will treat the place more as a holiday home. He said prices were yet to be set. Plans are for the houses to be tiny, at just 35sq m. A mezzanine floor or loft will maximise floor areas. Mark McGuinness, managing director of Willis Bond which is developing luxury Wynyard Quarter apartments, said the late Sir Ian Athfield had suggested “branches” of floating houses off Wellington’s former Overseas Passenger Terminal – now the Clyde Quay Wharf where Willis Bond developed 76 apartments in a $170 million project. But that idea was rejected. “In practice, it would not work because there were shipping and navigation issues,” Mr McGuinness said. Water is the most important material for human life on earth, but humans have changed it significantly. In her new exhibit “Green Room”, Julie Wolfe applied organic and chemical processes to a range of water samples – from a creek in Washington DC to melted snow in New York City – to create a colourful and stark portrayal of what humans are doing to water and how ecosystems try to rebalance themselves. We are very sad to share the news that a fire last week burned down 9 homes behind Java Cafe. Fortunately no one was hurt. Included in the damage was our office, our entire cafe stock, all our equipment for art events and over 150 artworks were completely destroyed. This is devastating for the artists and for us. The majority of the work lost were by Chath PierSath as well as Anida Yoeu Ali, David Harding, Eiko Naganawa, Genevieve Marot, Keeda Oikawa, Neak Sophal, Nicolas C Grey, Oeur Sokuntevy and William Graef. In the coming days we will announce a fundraising campaign to support the artists who lost their artwork and to replace the equipment that was burned. We appreciate any support that can be provided, thank you! The 20th century intellectual Keng Vannsak is a hard man to pigeonhole. Professionally, he wore many hats: philosopher, historian, linguist, professor, playwright, novellist, poet and, for a short while in the 1950s, statesman. During his life he invented the first Khmer typewriter, headed a major post-independence opposition party and published endless volumes of material ranging from literary criticism, to historical research, to linguistic treatises. To some he was a champion of Khmer identity, regularly churning out grandiose treatises on Khmer history. To others, such as the late King Norodom Sihanouk, he was a menace and a quack. Whatever he was, Keng Vannsak stands as one of 20th-century Cambodia’s most influential figures. He is also one of its most controversial, having acted briefly as a mentor to the young Pol Pot in Paris. But on the eve of what would be his ninetieth birthday on September 19th, the full scope of Vannsak’s legacy remains murky, and few outside of Cambodia’s educated elite have heard his name. Filippi speaks rapidly and authoritatively. With baby-blue eyes, a wide forehead and a chipped front tooth, he lectures passionately about the past, flashing a knowing grin or raising up his hands in exuberance when arriving at a point. In a Phnom Penh cafe, Filippi described the life of Keng Vannsak, who he first met in Paris in 1997. The pair corresponded regularly for the next 11 years, until Vannsak’s death in a Montmorency hospital from lung failure at the age of 83. At the core of his work, Vannsak sought to discover the pure essence of “Khmer-ness”. “Keng Vannsak was looking for what was really deep inside Khmer civilisation. He was trying to go as deep as possible,” said Filippi. But it was an unorthodox vision. Vannsak was convinced that Cambodian culture had been corrupted by outside influences, mainly Theravada Buddhism and Hinduism. To find the “original Khmer” meant tracing Khmer culture back to a time before Indianisation – a process which began in the first century AD and which brought Indian writing systems, cultural traits and religions to Cambodia. 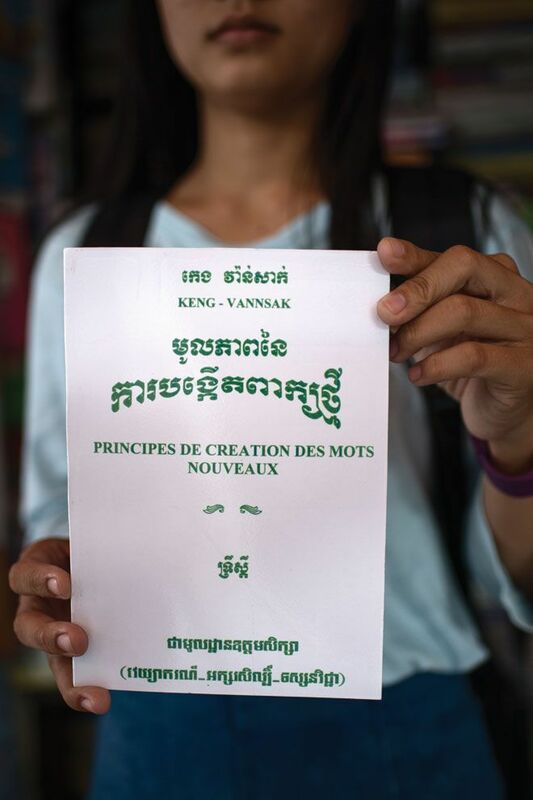 One of Keng Vannsak’s most impactful works was his book Principe de création des mots nouveaux, (Principles for the Creation of New Words), published in 1964. It laid out a framework for coining new Khmer words, and was put forth as an alternative to the authoritative system devised by prominent intellectual monk Chuon Nath, lead author of the first Khmer dictionary, published in 1938. Vannsak’s system, called Khmerization, argued against Nath’s method of employing Pali and Sanskrit scripts as a basis for formulating new words. Vannsak insisted that new words should be created true to Khmer’s Austroasiatic roots. His new method spurned a vigorous debate among intellectuals and later a campaign, led mostly by former students, to reform Khmer orthography and introduce words made through Khmerization into schools and universities. The debate burned until as late as 2008, when Prime Minister Hun Sen decreed that all schools, government documents and newspapers would henceforth use words strictly from Chuon Nath’s dictionary. That is not a completely outlandish idea, but he embellished this with charts and illustrations of Angkor sculptures purporting to show the pernicious influence of Buddhism,” remembered Donald Jameson, a US diplomat in Cambodia during the ’60s who spent many afternoons with Vannsak in his “very unique wooden house” in Tuol Kork. “[Historian David] Chandler once described Vannsak to me as ‘a suitcase full of loony ideas’,” he said. Certainly, the Kampong Chhang native was a bold thinker and many of his ideas ruffled feathers. After all, he was opposed to the two institutions which made up the backbone of Cambodian society: the Buddhist sangha and the monarchy. 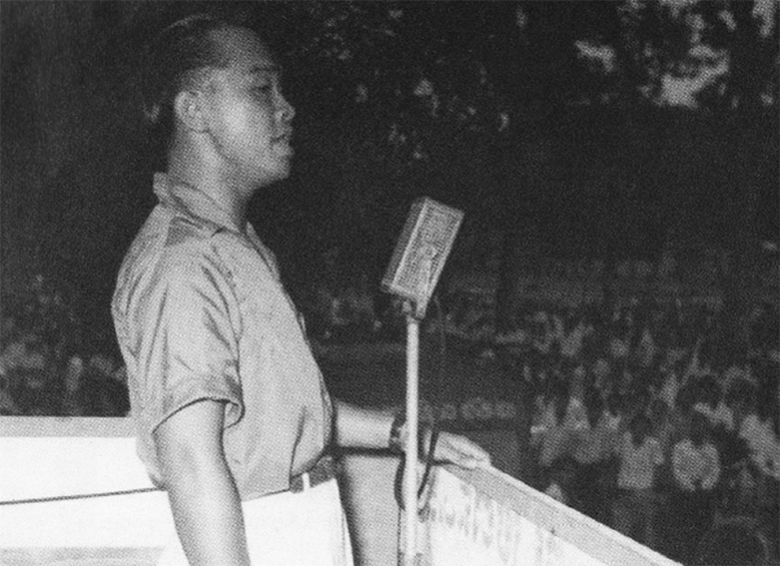 While leading the Democratic Party’s campaign in legislative elections in 1955, Vannsak regularly advocated doing away with the throne. He had published a book of poems, Virgin Heart, which used Buddhist metaphor to pillory the monarchy. To Vannsak, the royal family weakened national unity. Unsurprisingly, he earned a nemesis in King Norodom Sihanouk, who imprisoned him briefly in 1955 on the eve of the Democratic Party’s defeat – and the abdicated king’s success – at the polls. Later, in mid-1968 following the Samlaut uprising, he was put under house arrest for allegedly inciting students to revolt and possessing leftist sympathies. 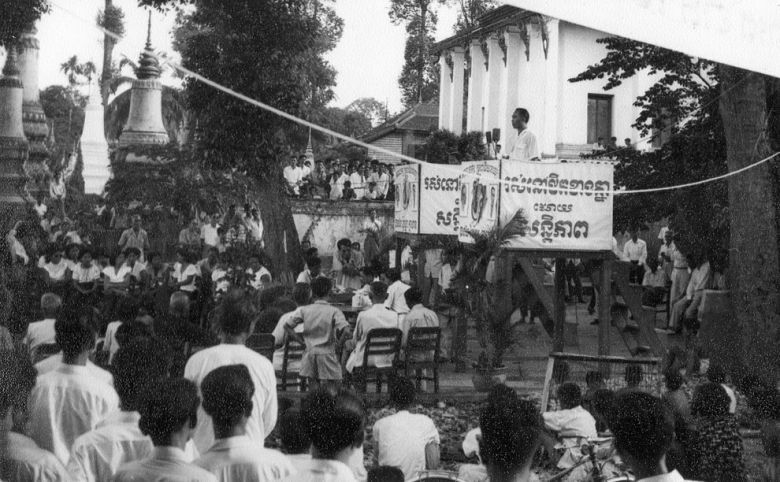 His fortunes changed after the coup d’etat in 1970, when coup-leader Lon Nol took a liking to Vannsak and his anti-royalist leanings and personally placed him as head of the newly christened Khmer-Mon Institute. But Vannsak quickly became disillusioned with the propagandistic school and stepped down a year later. He moved to Paris in 1971 to work for UNESCO as Cambodia’s deputy representative and chargé d’affaires of Lon Nol’s short-lived Khmer Republic in France, where he would spend the rest of his life. In one of Vannsak’s final controversies, one that exemplified well his contrarianism, the historian claimed in a 2007 radio interview with Radio Free Asia that the mother of King Jayavarman VII, one of the most revered figures in Khmer history, was of Cham ethnicity. Vannsak clarified that he meant not to squander the ancient king’s reputation, but only to seek the truth regarding the roots of Khmer culture. It was an intellectual quest that had come to define his life. It was also a question that had come to obsess another prominent countryman of his era – Saloth Sar, better known as Pol Pot. Vannsak and Sar knew each other well. They had met while both in Paris during the early 1950s. Sar was there on a scholarship and Vannsak for teaching. Sar and Vannsak became regular fixtures in each other’s lives: Vannsak’s French wife helped Sar find an apartment above a wine seller on Rue Letellier, across the street from Vannsak’s own flat. 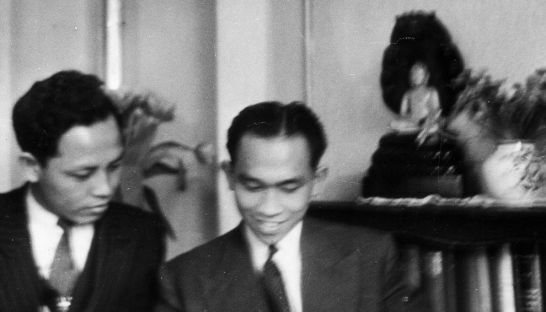 Vannsak was a mentor to the young Pol Pot and other burgeoning Khmer communists in Paris. They would often gather in Vannsak’s apartment in the 15th arrondissement to discuss events back home and political texts such as Stalin’s The National Question and Marx’s Das Kapital. “I was their brother, their friend, the thinker, the professor. They learned to think, to reflect, by listening to me, by following me,” Vannsak told Philip Short. Historians debate the extent to which Vannsak’s ideas influenced Sar. Did the outspoken professor nurture Sar and company’s radicalisation? Filippi thinks not. “It is very tempting and some people have considered that Keng Vannsak may have influenced these people. It is totally untrue. These people had already written their PhD theses,” he said. From the fall of the Khmer Rouge on, Vannsak regularly denounced Pol Pot and his cronies. “They messed up everything … they put the country on its knees,” he said in 2002 to Short. He did not, however, try to whitewash his relationship with the young Sar. “What he received from me – I say this without any pretentions – was an intellectual and political formation, a way of seeing things, of thinking, of predicting,” he said in 2002. 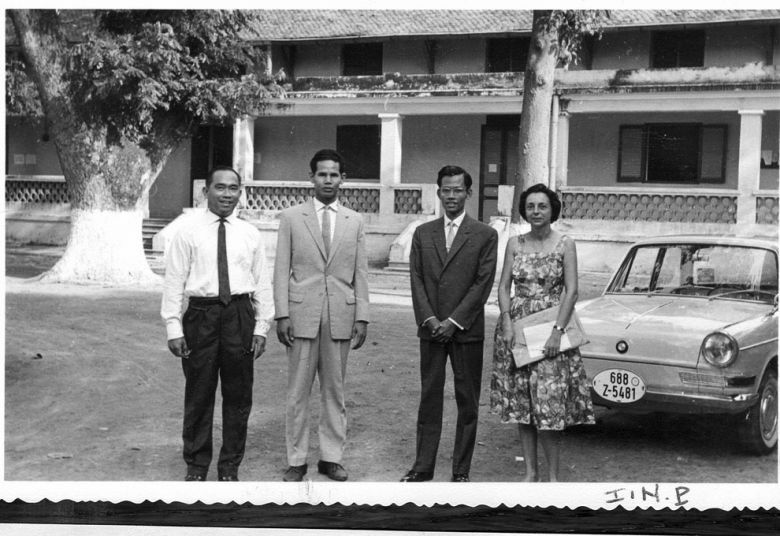 Filippi said that despite Vannsak’s wealth of published material, most Cambodians’ understanding of the prolific intellectual remained surface deep. “Everyone knows Keng Vannsak here. But ask what he did and what he wrote – people won’t know,” he said. In his poetry, Vannsak ignored the traditional metring system employed in Khmer poetry and used a fresh form, often including crude language and facetious metaphor. “His poetry is a masterpiece from several points of view … We could call it a revolution in poetry,” said Filippi.